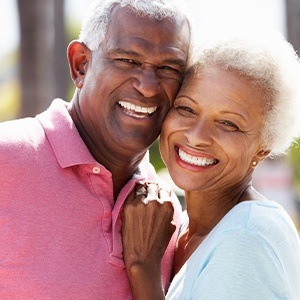 For many people who have suffered tooth loss, dentures in Bloomfield present an effective and affordable way to regain a complete, functional smile. But what exactly are dentures, what benefits do they offer, and what is the process like for getting them? Full dentures in Bloomfield. These replace an entire arch of teeth (either all of the top teeth or all of the bottom teeth). Partial dentures. As their name implies, partial dentures replace just a few teeth. The missing teeth do not have to all be adjacent to one another; a single prosthesis can replace multiple teeth throughout the mouth. Dentures usually stay secure in the mouth via natural suction or with the help of a mild dental adhesive. In many cases, partial dentures have metal clips that help them remain in place so their wearers can enjoy a comfortable fit and strong bite. 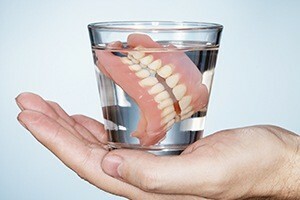 What Benefits Do Dentures Offer? The ability to enjoy a wide range of foods. Although it may take a bit of time to learn how to eat with dentures, they will enable you to consume most (if not all) of your favorite foods. A beautiful appearance. Well-made dentures look extremely natural in the mouth. In fact, onlookers may not be able to tell that you’re wearing a prosthesis. Dentures can also help to prevent the “sunken cheek” look that often occurs after extensive tooth loss. Security and comfort. Many people believe that dentures are prone to slip out of the mouth frequently or cause gum irritation. However, if your artificial teeth fit well, you are unlikely to experience any serious problems with them. Easy care. Dentures require daily cleaning, but keeping them free of food particles and bacteria isn’t difficult. Your dentist in Bloomfield will give you instructions on how to care for them in order to make them last as long as possible. Most people who have lost multiple teeth are candidates for dentures, but your dentist will still have to examine your mouth to make sure it can support a prosthesis. They may also discuss alternative tooth replacement options with you, such as dental implants. If you decide to get traditional dentures, your dentist will take some impressions and measurements of your mouth and design your new teeth. A laboratory will create your denture, and you’ll return to the dentist for a final fitting. The entire process for getting dentures may take place over several weeks or months and require multiple appointments with your dentist. 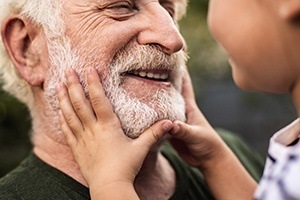 After you get used to your dentures, always stay mindful of how they fit; changes to the shape of your jaw may mean that you’ll need to get them adjusted periodically. 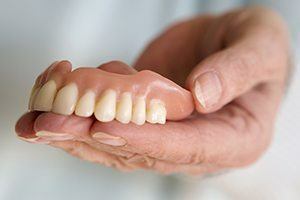 After five to eight years or so, it’s likely that you’ll need to get new dentures altogether.